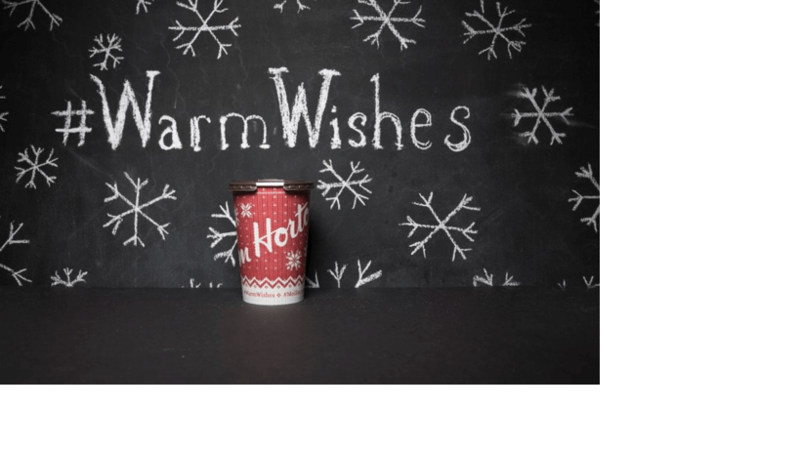 This week Tim Hortons started rolling out its newest campaign, #WarmWishes, as the brand transform itself for the 2015 holiday season. As part of the new initiative, Tim Hortons wants to recognize Canadians across the country step up to help one another. Whether it’s helping a neighbour carry groceries, buying coffee for colleagues or donating clothing to a shelter, these small acts of kindness go a long way to spread warmth in our communities. this is the second year that Tim Hortons is taking time to recognize the these good deeds of Canadians. From now until December 20, Canadians can share their #WarmWishes on social media for a chance to win one of five donations of $5,000 to a charity of their choice. Not afraid to embrace the true nature of the holiday season, Tim Hortons is also rolling out special holiday cups arrive across the country (image above). and they have also transformed its location in Grimsby, Ontario, into a House of Warm Wishes: a picturesque snow-covered log cabin, complete with holiday lights outside and a cozy-as-can-be chalet-style interior. And, for one day, the restaurant’s guests can request good deeds on behalf of their community and Tim Hortons will help bring those deeds to life. A contest has also been launched to engage guests and social media fans with weekly themes: Give a Little Warmth, Connect with Someone, Brighten Someone’s Day, Lend a Helping Hand, Spread Cheer, and Give Back. To participate in the campaign, guests can share the good deeds that they are doing on Instagram or Twitter by mentioning @TimHortons with the #WarmWishes hashtag. With each good deed shared on social media, users will receive a unique entry for a chance to win one of five $5,000 donations, going to a charity of their choice. Whether it’s holding a door open, reaching out to an old friend, baking cupcakes for colleagues, or donating clothing to a shelter, all deeds big and small will help spread warmth.